Our monthly show on Ujima 98FM, Bristol, UK is now online available to stream or download. You can catch the latest releases from Ill Truth, NU LOGIC, Danny Byrd, TerraHawk, Subtension, Lurk (Exclusive from Infidelity forthcoming ‘Pinna EP’), Shimon, Break, The Force, TI, S.P.Y, Optiv and CZA + more. If you want to catch up on any of our shows over the past 2 years, check out the playlist below where you can stream or download any of the 2 hour shows. We’ve just uploaded teaser videos for every track on the ‘Evolve: Phase Two LP’ to our YouTube channel. You can buy the full LP exclusively from Beatport now or pre-order from all major digital outlets for worldwide release on the 12th May. Having been released as a Beatport exclusive on Friday 28th April, ‘Evolve: Phase Two LP’ is now available to pre-order from all other good digital outlets, prior to it’s worldwide release on the 12th May. The anticipated release of the first various artist LP, ‘Evolve: Phase Two LP’, is OUT TODAY as a Beatport exclusive. The release has had support from the likes of TC, SPY, Mind Vortex, Fre4knc, Kenny Ken, Logan D, Kolectiv, Aries, JFB as well as over 40 radio shows, you can read the full support list and quotes below. The LP will then be available worldwide from all good digital stores from the 12th May 2017. The Evolve series enters its second phase and in doing so brings with it 5 new faces alongside already established label artists, in a 10 track fusion of both fresh and maturing talent. We’re excited with the planned progression of ‘Evolve’ as we present the label’s first LP – the ethos behind the name begins to manifest. As a label we’re proud to be advocating gifted artists from our home city of Bristol and surrounding areas and will continue to do so, as well as further afield, prolifically over the course of 2017, across the Evolve series and solo EP’s. Label bosses TerraHawk head up what is a strong release alongside Altered Perception, Subtle Element, Creatures & Lurk, paving the way for the likes of Constrict, Bass Sheriff & ReEdit, Ruxim, Obscure Form and Crom to contribute this year’s onslaught of Infidelity releases. Look out for fresh EP’s from Lurk, Creatures, Bass Sheriff & ReEdit over the next few months. Rough Tempo x 10 shows, Four Aces Radio, Kool London x4, WUTK FM, Hush FM USA x 2 shows, Bassport FM, Dream FM, DNBVault, UrbanUK.FM, Bedlam Radio, Sound Wave Radio, DNBRadio x 2 shows, NinjaNinja DNB Blog, Bassdrive x 2 shows, Futuresound Radio, Mercenary Radio, Ujima 98FM, OTB Show Blackpool, GlobalDNB, Cre8 DNB, Q Base FM, Darksyde FM, Dublin South FM, Drums.ro, Brum Radio, LondonPirateRadio.co.uk, RogueFM.com. April’s Infidelity Records show hosted by TerraHawk is now available to listen to and download from soundcloud. 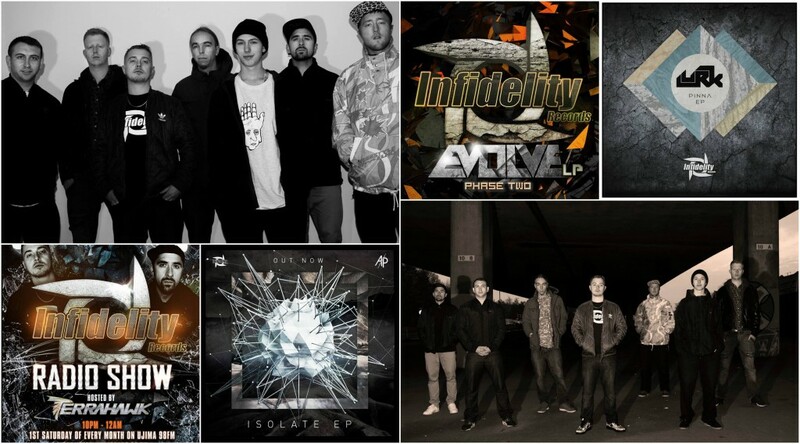 This month’s show features a whole host of worldwide exclusives from Infidelity, including more tracks from the forthcoming ‘Evolve: Phase Two LP’ and a first look at 2 of the tracks from Lurk’s ‘Pinna EP’, which is set for release in June. There is also a first ever play of ‘Surreal – Eternal ft Maisie Crossland’, which will be getting a release later this year – hold tight for more details on these releases! You can find the full track playlist of the show on the soundcloud track page. Vinyl Junkie Guetto Dubz Mix – 28 mins.